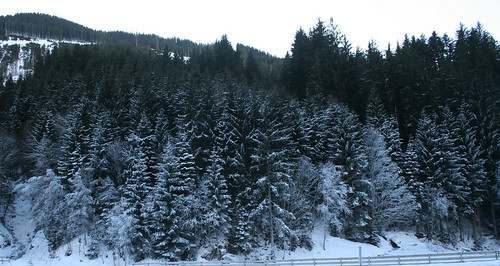 Perhaps it was the cold weather, the exercise and all that fresh air, but I found everything in Austria so appetising. 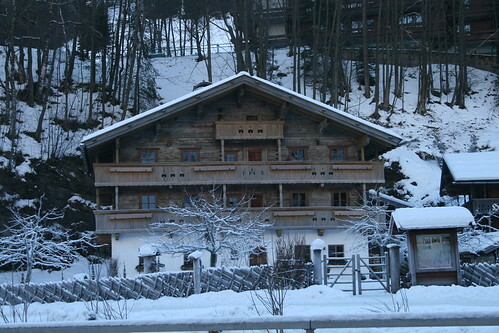 Even the Alpine scenery looked good enough to eat, with its gingerbread houses and Christmas trees dusted with icing sugar. I felt like I was walking on top of a Christmas cake and could take great bites out of everything. We certainly ate well out there. We had breakfast and dinner each day in the hotel (except for a couple of evenings which I’ll tell you about) and lunched out and about in the resort. The hotel food was fairly basic but good and filling; pretty much what you’d expect from a ski hotel. 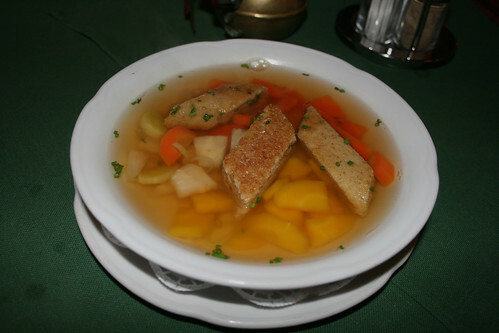 One of the more memorable dishes was a carrot and honey soup, which was light and surprisingly delicious. I’d like to have a go at recreating it one day – it seemed simple enough; the carrot was grated and surrounded by what I suspect was a vegetable stock with just a touch of honey stirred through. 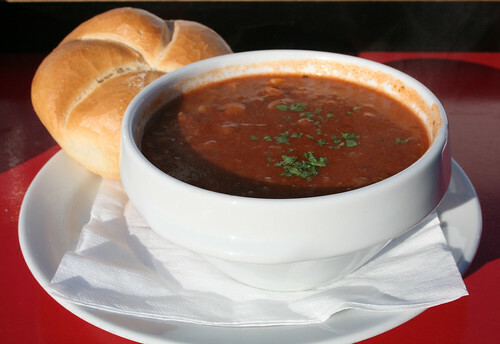 Lunch was always good, whether a hearty bowl of beef goulash eaten outside in a bar at the bottom of the slopes, a platter of cold meats and cheese or a good old hamburger and chips. 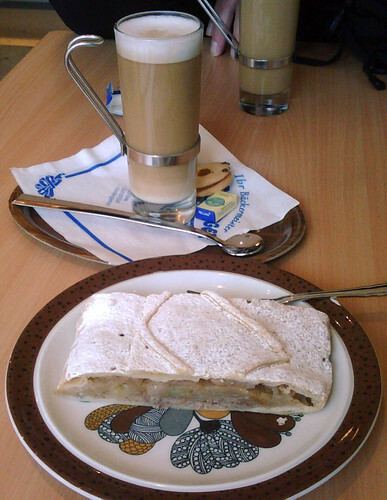 Favourite pick-me-ups in the day included delicious apple strudel, which I wish I could have right now, and hot chocolate with rum and cream on top. Oh yes, we ate well. 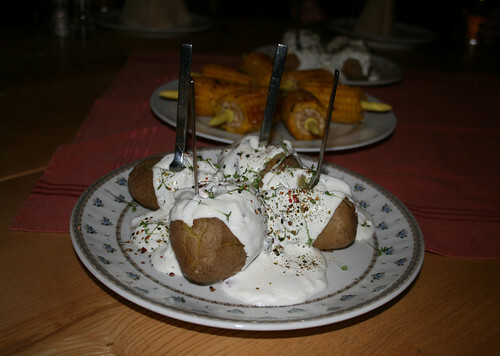 Rob and I went out for a traditional Austrian meal one evening which we thoroughly enjoyed. We started with soup; Rob had a tomato soup and I had a delicious clear vegetable broth. For main course Rob chose a fantastic Tiroler Gröstl, which consisted of cubed potatoes, sliced beef and bacon cooked and served in a copper pan with a fried egg on top, and I had Tafelspitz: boiled rump of beef (from a local national park) with clear soup, root vegetables, roast potatoes and warm chive sauce. Although boiled beef doesn’t sound particularly appetising, let me tell you it was absolutely delicious. 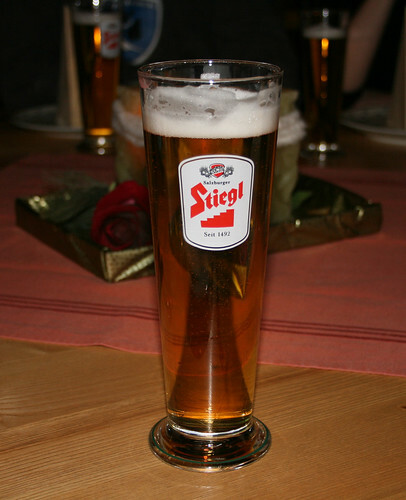 Another thing I took a liking to was the Austrian beer. I’m not a beer drinker – wine is my drink usually – but this was lovely and light and, best of all, didn’t give me a hangover! 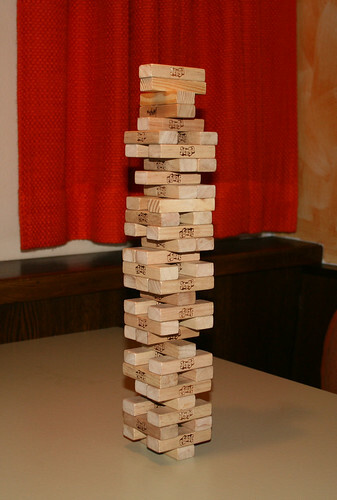 It went down very well during the après-ski and a particularly enjoyable (if a little drunken) game of Jenga back at the hotel one night! Another drink popular with our group was Glühwein, or ‘glowing wine’, which is mulled wine drunk in Germany and Austria and perfect for warming you up when you’re surrounded by all that snow. 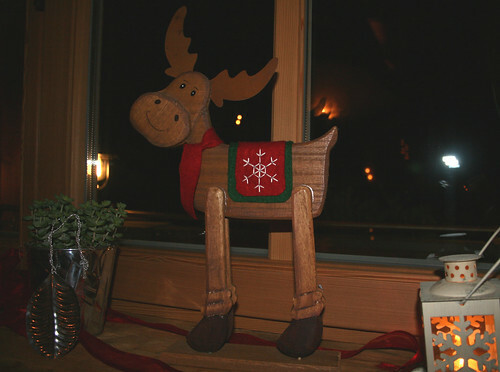 It was this that we were greeted with on a trip to a mountain restaurant further up in the resort, organised by the ski company for the hotel chef’s night off. When we arrived it was lightly snowing and it was really quite magical and romantic standing outside the restaurant drinking hot mulled wine looking down into the resort as the snow flakes fell. It was the perfect start to a wonderful evening. Like every restaurant and bar we entered, the restaurant was heated so well it was almost glowing and as we unwrapped our layers of clothing we warmed up and felt cosy and at home. The buildings we saw in and around the resort were all true to Austria and quite charming, made with beautiful wood, and this restaurant was no exception. One of the more interesting decorations inside was a rather scary looking creature which our rep explained was a Krampus who, according to Austrian folklore, is a demon who comes after bad children at Christmastime with a whip. It is customary for people to dress up as the Krampus during a Christmas parade through the villages. 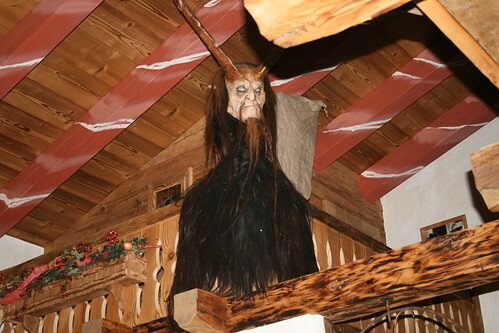 Christmas in Austria sounds wonderful, with festivals and Christmas markets, but I have to say the Krampus sounds absolutely terrifying, the poor children! 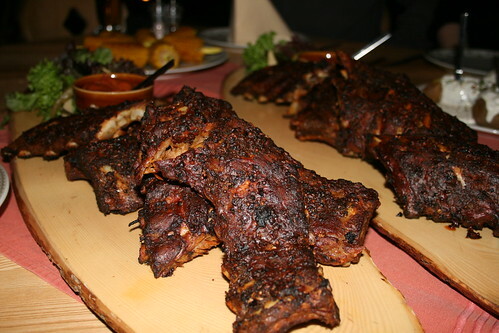 Our meal in the restaurant was just the thing for a hungry party: ribs; corn on the cob and jacket potatoes smothered in soured cream. Dessert was Kaiserschmarr n mit apfelmus: sliced apple pancakes with apple sauce, and it was really, really good. 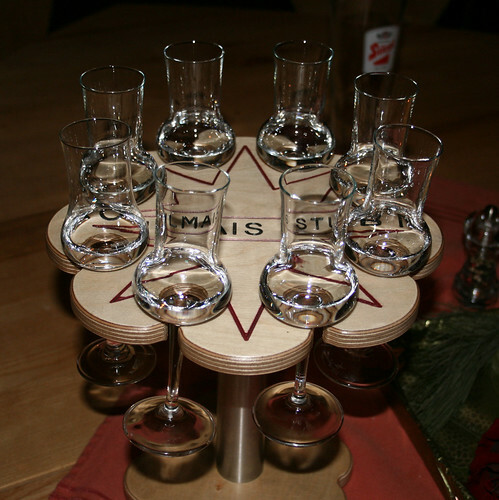 We finished off the meal with a round of Schnapps which warmed us to our toes before we headed off into the cold, crisp night. Look out for the final part of this post next week. 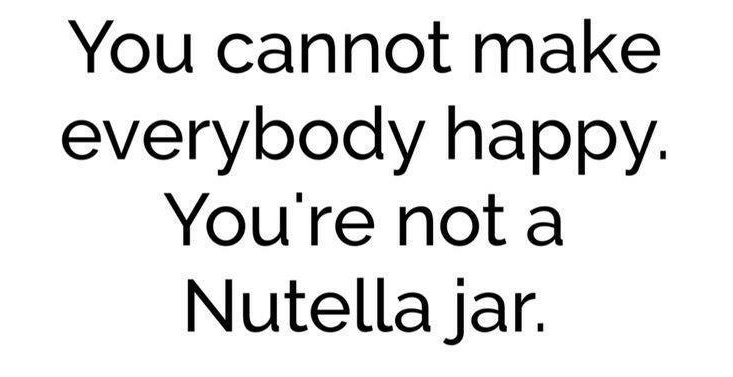 I’m so darn hungry now I can’t stand it! Thanks for sharing your trip. 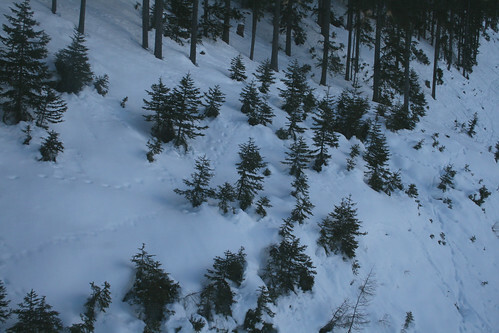 This has all the making of a fantastic ski trip – excellent! The food looks glorious and yummy! And the gingerbread houses are real? It all looks wonderful Julia, glad you had a great time! Great pics and wonderful food! 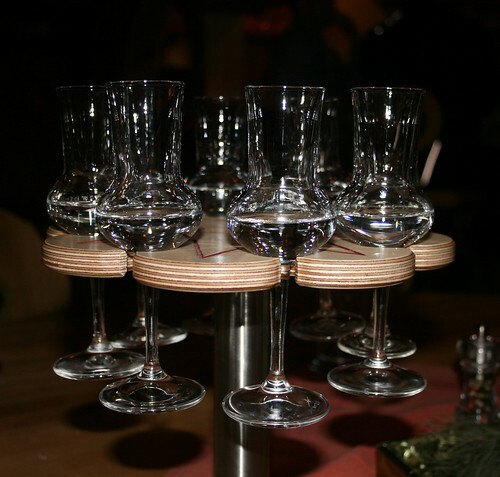 Isn’t tafelspitz great? When you first read the description you think urrrgghhh, boiled beef. But in reality it is wonderful, and I like the theatrical way that it’s served too. 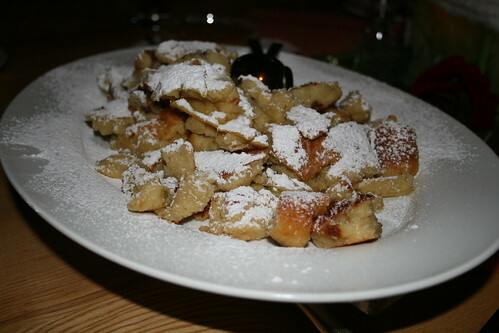 And mmmmm, Kaiserschmarrn! Looks like you had a fabulous time. What an amazing post and the food photos make my mouth water. 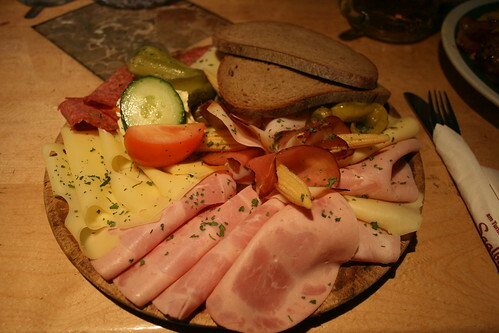 Austria definitely has a rich food culture with many different dishes to choose from, not just schnitzel. 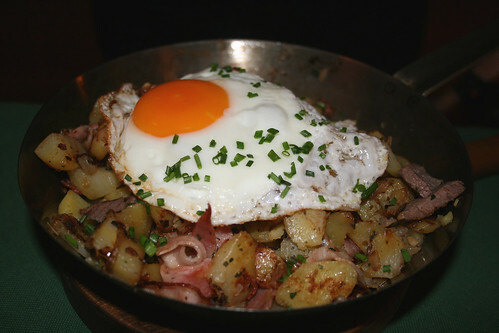 Especially the Tiroler Grostl just makes my mouth water! Welcome to Europe. Great photos – we’ve had a tonne of snow in Britain last week, but sadly we’re unused to it and therefore hopelessly ill equipped, unlike our Austrian friends. Absolute chaos. 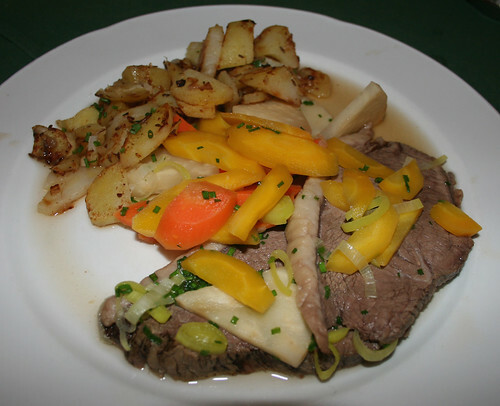 Ilove the Austrian boiled beef. Its so simple yet delicious. P.S. Also, I just added you as a friends on MyBlogLog!